SAN FRANCISCO: The new 2002 Isuzu Axiom is one of the growing breed of "crossover" vehicles that combine the versatility of a sport utility vehicle with the styling and luxury of a sedan, or really a station wagon. Since it received rave reviews as the ZXS concept vehicle at the 1999 Tokyo Auto Show, Isuzu rushed the Axiom into production with few changes from the concept version. In todays world of look alike vehicles, the Axioms styling is distinctive enough to get many favorable comments. About the only criticism, which with I agree, is that the front-end styling might be too aggressive and truck like in comparison to the sleek and elegant tail end treatment. 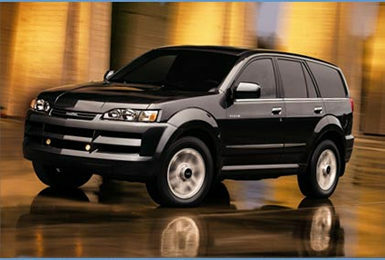 The Axiom comes either in four-wheel-drive or rear-wheel-driven two-wheel-drive form. There are two trim levels for each, Base and premium XS. A single engine is used in all Axioms, a 3.5-liter V6 with dual-overhead camshafts, four-valves-per-cylinder, and a variable intake system. The engine produces 230 horsepower at 5,400 rpm and 230 ft-lb of torque at 3,000 rpm. Only a four speed automatic transmission is offered and it can be operated by a dashboard mounted button in either a "power" mode for enhanced acceleration or "winter mode where torque delivered to the wheels is reduced to help prevent wheel spin and loss of traction on slippery surfaces. Four-wheel-drive models feature TORQUE-ON-DEMAND® full-time four-wheel drive, which automatically transfers power from wheels where slippage can be detected to wheels that have better traction. Unlike many SUVs today, the Axiom has a Shift-on-the-Fly two-speed transfer case that provides a super-low, fully locked 4x4 for more serious off-roading. There are even skid plates to protect the transfer case, radiator and fuel tank. The EPA numbers are 16 mpg city and 20 mph highway for both the two and four-wheel drive versions. The fuel tank holds 19.5 and all Axioms can tow a very respectable 4500 pounds with no need to order an extra towing package. The base Axiom is priced at $25,985 for the 2WD version and $28,465 for 4WD, and comes well equipped. Items like anti-lock braking, tilt steering column with leather wrapped steering wheel, keyless entry and alarm system, power windows and door locks, power drivers seat, automatic climate control, eight speaker AM/FM/Cassette/CD system and a full-size spare tire are all standard equipment. If you opt for the XS versions, you also get a powered moonroof, roof rack, fog lights, power passenger seat, heated leather seats, and body side moldings. The 2WD XS lists for $28,305 and $30,785 for the 4WD XS. All Axioms feature Intelligent Suspension Control (ISC) which uses multiple sensors to adjust shock absorber damping abilities to optimize ride and handling. ISC can be adjusted to either sport or comfort mode through the use of a dash-mounted switch. Also standard is the very comprehensive Multi Information Display in the center of the dash that presents information such as outside temperature, instant and average fuel economy, driving range, an atomically correct digital clock, calendar, stop watch and even GPS coordinates. The Axiom will seat five, four in luxury, and the 60/40-split rear seat can be folded down to handle more stuff. The Isuzu interior stylists did an excellent job in designing a very luxurious look inside, that is well executed in both fit and finish. The leather and other materials used rival cars with twice the sticker prices I have recently driven. The sound system is among the best I have ever heard and I really like the easy to use radio controls that include a knob for station tuning - just like in the old days. However, when information from the sound system and climate control system is added to the other items displayed on the Multi Information Display, there is more data than can be digested in a quick glance. The nicest thing about it is the display is readable under all lighting conditions.